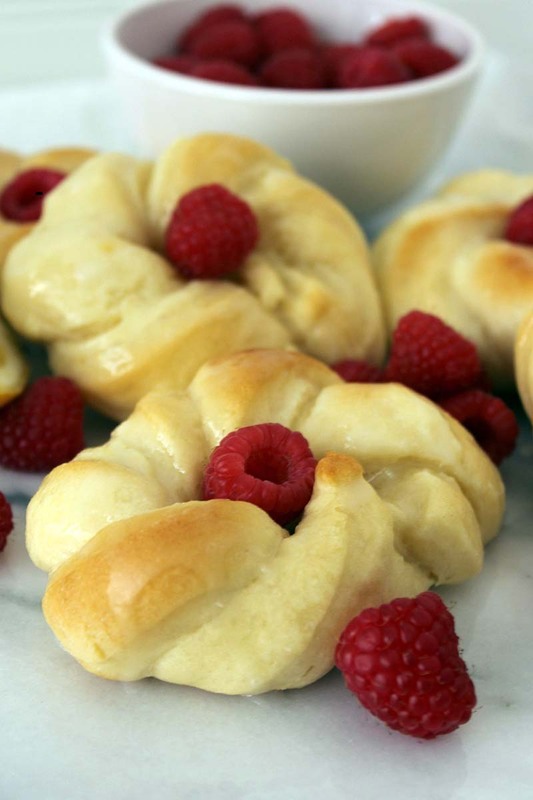 Fresh and sweet, these lemon sweet roll twists are perfect for any occasion. The dough is light with a filling that is full of creamy lemon flavor. Combine warm milk and yeast in a large bowl; stir to combine. Let sit for 5 minutes. Add in egg, oil, salt, sugar, stirring with wooden spoon or dough whisk. Slowly stir in 1 cup of flour at a time (3 cups total) – keep ½ C flour for dusting the counter. Take dough out of bowl and knead on floured counter until a smooth ball forms. Place in a warm area covered with a clean tea towel until doubled in size, about one hour. While dough is rising, prepare Filling: using mixer combine cream cheese, lemon juice, zest and sugar until smooth. Place in fridge for 30 minutes. Once dough has doubled in size, roll out on a well-floured surface into a 18x24-inch rectangle. Spread lemon cream cheese mixture on dough, leaving a ½ to 1- inch border. Using pizza cutter, cut dough into 1-inch strands. Then cut the rectangle in half horizontally. Cut each strand carefully in half only ¾ of the way up the strand. Carefully braid (twist) each strand – work quickly so the filling stays in place. Bring two ends together to form a ring and pinch firmly. Place on a parchment paper lined baking sheet. Cover and let sit in warm area for 30 minutes. Bake rolls for 10-15 minutes, or until golden brown. While rolls are baking mix together the Glaze ingredients. Add more/less lemon juice to achieve desired consistency. Remove rolls from oven and let cool on wire rack. Once cooled drizzle glaze on top. Garnish with berries if desired. Place leftovers in the fridge and reheat, as desired. Recipe created by Petit Foodie.